User-oriented giveaway from Leawo Software returns again, with top selling Blu-ray Creator as the real boon for both Win and Mac users. 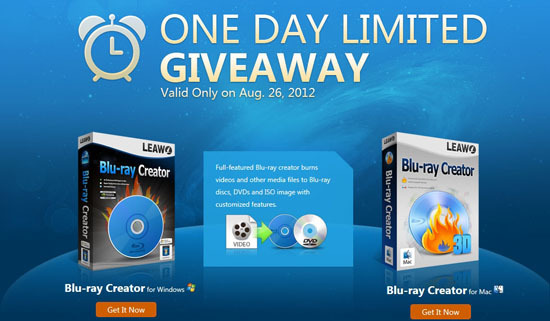 On August 26, 2012, Blu-ray Creator Giveaway will be available on giveawayoftheday.com. And simultaneously, full-scale special offer will get underway on Leawo official website which allows giveaway users to obtain multimedia products with 20% Off Coupon Code. As to how can you free get access to the two programs provided, the steps are quite easy to follow. Firstly, download and install the software on the scheduled day August 26. And then go to http://www.leawo.com/cooperation/giveaway-of-the-day.html to get your registration code by offering your name and email address. Finally, use the registration you received to activate the program and afterwards enjoy the full functions of it. You should notice that technical support and free upgrade services are excluded in giveaway software. If you need it indeed, get the products with 50% Off Coupon Code: GOTDL50. Other products that help you convert video/audio/DVD/BD will also enjoy 50% Off Coupon Code. Remember the coupon will expire on Aug 31st, 2012. Surprises come on the heels of the giveaway issue, Leawo Software also provides 20% Off Coupon Code: LEAWO20 for all giveaway users to shop all Leawo multimedia solution products. This special offer will be valid until Sep 30, 2012. We also provide online support for all problems you have encountered with. Contact us via giveaway@leawo.com if necessary. Get ready now? Time waits for no man, so does the rare opportunity. We will wait for your joining in here from now on. Buddies, as a sports enthusiast I am quite excited to share this good news for you all: from July 25 to August 19, 2012, the great reputed multimedia solution provider Leawo Software is rolling out up to 20% or 40% price-off promotion for celebrating the quadrennial Olympic Games. By using 20% OFF Coupon Code: OLY20OFF when purchasing all products on official website, and get some specials with 40% price cutting off, it definitely saves you a large amount of money, and at the same time provides you with a wonderful and exceptional London Olympics. The fascinating contest videos can be converted to playback on various players with Video Converter. To get this program this time you can save at least 40%. Watch 2012 Olympics in 3D is also available. To keep 2012 Olympics videos, you can get 40% off Blu-ray Creator, which helps you to burn videos to DVD disc as well as Blu-ray disc. 3D disc video is also provided. Some more can be dug out from Leawo like download Olympics videos, transfer Olympics videos, etc., and 2012 Olympics brilliant performances will present to you. The London Olympics opening ceremony was seen across the world, giving us a taste of what is to come. 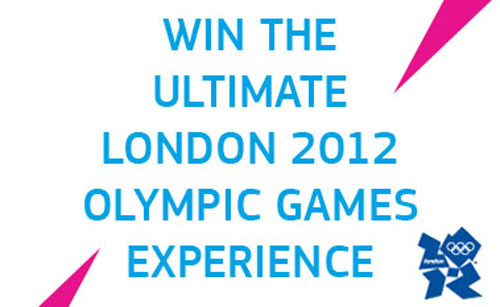 Why not seize the chance to gain some solutions to make your own 2012 Olympic Games. By the way, you can easily to purchase what you want through SWREG and Avangate payment platforms. Should you notice that some programs including Video Editor, Data Recovery, Photo Recovery, SWF Encrypt (Win+Mac), SWF Compressor are excluded in this 2012 Olympics promotion. Attention now: the right to first debut Leawo Blu-ray Creator for Mac is scrambled by lots of giant tech media websites, and finally the product initial launch right is won by CNET after keen competitions. The most powerful Mac Blu-ray Creator CNET product launch rolls out right from the moment on and it is really a boon to video lovers, especially when you have the demand to make DVD and create Blu-ray disc. Nowadays more and more people are inclined to DIY something to add fun to the boring life, or improve the ability of handwork, or create stuff to fulfill inner need. Whatever goal you are going to achieve, it is generally admitted that we need to dig out the originality physically or mentally. Yeah, you have got my point, this smart Blu-ray Creator for Mac from Leawo Software is exactly what you are in need of to DIY something unique, so as to enrich your digital life. Building up cooperation with the reliable tech media website CNET that publishes news, articles, blogs and podcasts on technology and consumer electronics, you have no reason not to believe this stuff can really brings you with something creative and valuable. And we Leawo Software do promise you a top-notch multimedia tool. As the name suggests, this stuff is bound to largely optimize your experience on DVD and Blu-ray disc creation. All right, are you eager to get this program? Then don’t hesitate and free download Blu-ray creator for Mac for a trail. 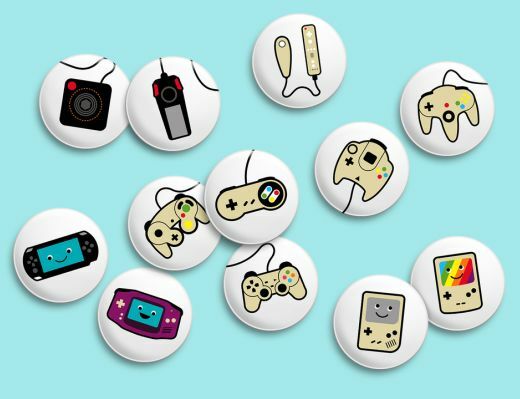 Both CNET and Leawo Software are with the wish to offer you with the optimal multimedia software, tackling with all video and audio problems. CNET Leawo Blu-ray Creator for Mac debut this time actually provides the most efficient DVD and Blu-ray creation solution for you. We are hoping you gain great fun and convenience in BD/DVD creating. Leawo Blu-ray Creator for Mac CNET initial release is under way right now! Tech fans like you must not want to be far behind others to get the first-hand tech news. Wouldn’t you?